In a country without adequate health care your survival beyond the age of 5 makes you one of the "lucky ones". You've overcome the odds. Then one day at 16 years old, you discover a small button tumour on your face. It grows rapidly over the next 8 years. You are helpless because there is nothing you can do and no one can help you. This is the story of Alimou Camara from Conokry, the capital of Guinea in West Africa. Alimou was born in 1984 and schooled in a catholic mission, despite his Muslim background. His parents died when he was young, and he was left with his 3 brothers and 2 sisters. Today only two of his brothers are alive and both are married. At 16, Alimou had to stop school as the tumour grew in size and became an unsightly spectacle. His siblings supported him, but his friends abandoned him. People just laughed and rejected him. Soon he was unable to work or eat, and he began losing weight. His nephews and nieces grew afraid of him, his sister-in-law feared contamination and ordered her children not to drink from the same cup. He began to seclude himself, hiding away from a judgmental world. 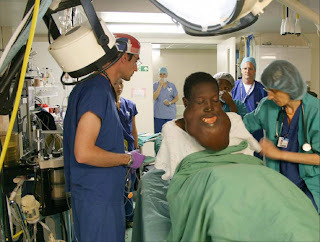 After 8 years his tumour, which hung from his lower jaw, had grown to the size of his head and had become a strain on his neck. His bottom teeth became embedded and displaced as the mass enlarged. He experienced headaches and a continuous watering of his eyes. Puss would seep from his mouth where the tumour protruded. Alimou would wipe it away, but the smell was overpowering. For the last several years he was unable to chew and forced to push the food to the back of his throat to swallow. Without medical attention benign tumours will slowly cut off a persons airway as they grow, and in many cases prevent the passage of food through the mouth. 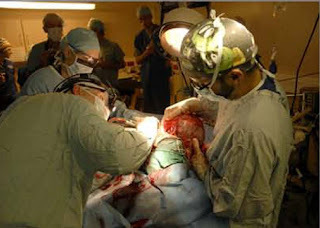 In hope, Alimou was not willing to settle began going out in public to various hospitals seeking help. Wherever he tried, no one was able to help him. In a last desperate attempt he sought help at Radio Familial, a local station known for it's humanitarian work. From there he was refered to John Erickson, a chaplain in the town of N'Zau who worked at the hope clinic. John told him about Mercy Ships that was currently in Liberia and a screening team was due in Guinea 1 week later and he was welcome to stay until then. The Mercy Ships team determined that he was an ideal candidate for maxillo-facial surgery and he was able to fly (his first time!) to Liberia for free, thanks to the world food program. 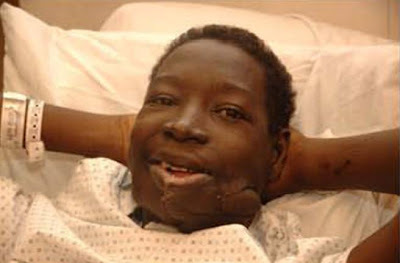 The 8 hours surgery involved removing the 3kg (6.6lb) tumour, his lower jaw and all his lower teeth. The surgeons removed the tumour and fitted Alimou with a titanium lower jaw. It was like dismantling a malfunctioning machine then reshaping it together to make it whole. The hour finally came when Aimou was conscious, without a mass on his face for the first time he was handed a small mirror, he examined his face quietly, in awe, tears slid down his cheeks, he was unable to speak due to the tracheotomy, but actions spoke louder than any words. He was amazed. He spent 10 days recovering on the ward and he summed up his thoughts on the care of the nurses, doctors and the surgery itself "It was Jesus who helped me because He is here". He still had no lower teeth or chin and had to continue to keep his food very soft. The remaining skin that stretched over his tumour needed time to shrink back and so he was booked for a return surgery later on in the year to have bones taken from his hip and placed around his prosthetic lower jaw to form a chin. These will naturally graft to the titanium jaw, the swelling will recede and he will be able to function better than he has in the last 8 years. His plans now: he wants to go back to school for accounting, he is also interested in economics. Given the obstacles he has already overcome in his life, we're sure he'll achieve his goal. Praise God for Alimou's life and pray for him as he returns and gets used to what normal life is like. It's kind of weird being in one outreach and yet preparing for the next outreach that will follow within approx 2 months of this one ending. Our next outreach in 2009 will be in the country of Benin. Already, French classes have started so we can at least get by when we're out and about. Now we're walking to Benin.......ok, not literally, We know for sure Tim won't be as he has to sail the ship there! 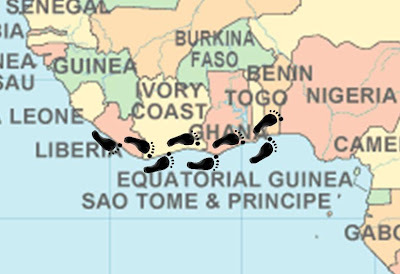 Crew members have been challenged to get into teams of 6 and walk the 908 miles it would take to get from Liberia to Benin. It has been calculated that walking from the end of the dock to the port entrance gate and back is 1 mile so every evening their is a continuous stream of crew members clocking up their miles. Each week the teams total their miles for the past week and hand them into the organisers who are plotting our steps on a map. Sharon has decided to join a team, plus it gives her a good excuse to shed some of the extra pounds she has gained since eating the good food that is cooked up by our chef on board the ship! So each evening she sets off with Nathanael in the stroller to walk or run 2-3 miles, listening to her favourite podcast or GCCC (Tim's church) latest church sermon. Sharon's team is named the "Charlies Angels" due to the fact that it's one guy (named Charles) and 5 women and last week we clocked up 91 miles between us, not bad when it's often pouring down with rain here! Click on the picture below to see a close up of our team in true "Charlies Angels" style! If you have never heard of Nick Vujicic, you need to check this man out at http://www.lifewithoutlimbs.org/ or even buy his DVD. We did a search on You Tube and he is very popular there too, click HERE to see footage of him. Mercy Ships had the piviledge of hosting Nick on board last week during his world tour visit to Liberia. Nick was born without any arms and legs and has such a powerful testimony. Some could feel quite uncomfortable when faced with such disability but he has such a natural ability to put you at ease in his company. He shares many jokes like not being a very good time keeper as he has no wrist watch, and his little foot is refered to as "his little chicken drumstick" which he can use to flip his mobile phone up to his ear!! Plus there were many stories where he has had fun with people, like hiding in the overhead luggage compartment on a plane waiting for the next person to open it up, imagine their surprise when there is Nick shouting "BOO". He gave us an evening of laughs and encouragement. 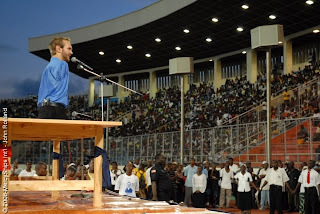 Nick spoke at many gatherings in Liberia where hundreds were expected and 8000 turned up to hear him speak. He was able to identify with many who were in a similar position without limbs and give them a message of hope. At the end of his farewell message the Life Without Limbs Team were approached by a lady carrying her 5 day old armless baby. The baby was brought onto the stage in front of the big crowd. The crowd watched as this armless baby was prayed for by a guy who has no arms or legs. Nick was able to show that this baby has value and not a curse as most Liberians would believe. We pray that Nicks testimony in this country has brought hope to many lives. Continue to pray for Nick as he continues his world tour in Ghana, Egypt, South Africa, Singapore, India, Hong Kong & China.